It's not often I get a large number of figures (or toys, or whatever you want to call these) of the same character; I can see I'm going to have trouble thinking up new things to say in the introductions to the reviews. Hey, did you know Eve (the Biblical one, not the robot) wasn't actually the first woman? According to various traditions, Adam and Lilith were created simultaneously, but Lilith refused to be subservient to Adam, and so God cast her out of Eden and made Eve for Adam to take her place. I always thought Lilith got a raw deal there; I like a woman with spirit. I wonder if anyone's just sworn never to read OAFE again due to blasphemy? Oh well, c'est la vie. Kids love building things - just look at Lego - and kids love robots, so a toy that lets kids build robots is an odds-on winner. WALL•E himself is a techy collection of gears and caterpillar tracks and oddments just made for hands-on manufacturing, but his soulmate EVE is a bit of a tricky prospect, having a kind of streamlined design ethos that looks like it was created that way rather than built from parts. Nevertheless, Construct-A-Bot EVE here does her part to merge modularity and femininity in the WALL•E range. This EVE comes packed in her component pieces - head, body, arms, and compartment cover - and it's up to the buyer to assemble her, which is no great struggle. 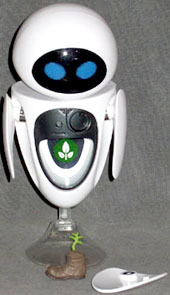 The head and arms are mounted on solid metal rods, rather than the clear plastic used for other EVE toys to suggest the free-floating nature of her body parts - the reason for this is that the "connections" are magnetic rather than plugs, with the rods settling into hemispherical housings in the body and held in place by one or more fairly strong magnets built into the torso. With the parts being plastic (aside from the connecting rods), the magnetic attraction, combined with thin soft plastic rings within the housings, are quite strong enough to hold them in any position at all. All three are therefore balljoints; the arms also have a secondary pin joint between the rod and arm. Since the head is kept light there's no internal mechanism to change her expression, so her eyes are simply the slightly-interlaced blue areas seen on less complex EVE toys. Fully assembled, EVE is 6¾" tall with her base, 5¼" on her own. Also magnetically attached, though not so strongly, is the cover for EVE's greens compartment. The cover fits smoothly into the front of her body, and is removed by way of a button on her back, which pushes the cover out of contact with the magnet keeping it in place. Inside the compartment are the usual details - black smooth techy bits up top, and the rest being a cavity for the storage of the sapling-in-old-boot accessory, with a silver sticker on the back wall. Her other accessory besides the sapling is her blaster right arm, which shows the arm's seams, and has internal black parts showing as the barrel, targeter, and recoil brace (I'm guessing that's what it is). The blaster has the same metal connecting rod as the regular arm, but lacks the additional "shoulder" joint. The base is the standard EVE kind of thing, an oval foot connecting via a curved neck to a plug-in point in her back - it's the only part of her that plugs in rather than being magnetic. 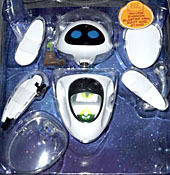 The finished Construct-A-Bot EVE isn't the most detailed or most versatile EVE on the market - the static expression is its main shortcoming relative to other similarly-sized and priced equivalents, though she scores a minor point for having an opening greens compartment without needing it to have a central seam. But anyway, every kid knows magnets are cool, and you never really grow out of that, or at least I haven't. And, in some small way, the magnetic couplings echo whatever scientific wizardry allows the real EVE's parts to hover in place without any physical connection. She's not the most suited robot to having a construction kit made of her, but they did a pretty good job anyway.